Serval range. Darker green: extant (resident). Brighter green: extinct. 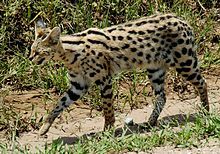 The serval /ˈsɜːrvəl/ (Leptailurus serval) is a medium-sized African wild cat. DNA studies hae shawn that the serval is closely relatit tae the African gowden cat an the caracal. ↑ Wozencraft, W. C. (2005). "Order Carnivora". In Wilson, D. E.; Reeder, D. M. Mammal Species of the World (3rd ed.). Johns Hopkins University Press. p. 540. ISBN 978-0-8018-8221-0. OCLC 62265494. ↑ Johnson, W. E.; Eizirik, E; Pecon-Slattery, J; Murphy, WJ; Antunes, A; Teeling, E; O'Brien, SJ (2006). "The Late Miocene Radiation of Modern Felidae: A Genetic Assessment". Science. 311 (5757): 73–77. doi:10.1126/science.1122277. PMID 16400146.